Chip Wade ( @chipwade) loves a spray finish with lacquer. Jen Woodhouse (@jenwoodhouse) has a super cool trick at the end of her coats to get that amazing shine! Clint Harp, @clintharpofficial, loves to keep wood in its raw state. 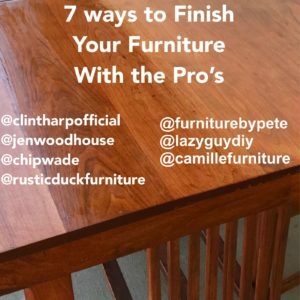 Pete with @furniturebypete has a great tip when you’re using oil based stain. Adam with @lazyguydiy has an easy and beautiful way to give your pieces the perfect antique look. Brandt with @camillewoodworking uses General Finishes and a spray gun to get his beautiful finishes. Try a brush technique that Amanda with @rusticduckfurniture uses for her builds!